National Playing Cards Museum, Druivenstraat 18, 2300 Turnhout. The museum building has an elevator and is therefore wheelchair accessible. Turnhout is located next to the E34 motorway and can be easily reached from Antwerp (at 42 km), Brussels (at 95 km), Ghent (at 105 km) and Hasselt (at 65 km). From the Netherlands: Eindhoven (at 49 km), Tilburg (at 35 km), Breda (ar 39 km), Rotterdam (at 85 km). Choose exit 24 on the E34 motorway to reach the centre of Turnhout. in the Muylenberg Car Park, Sint-Jozefstraat, 2300 Turnhout (opposite the museum). 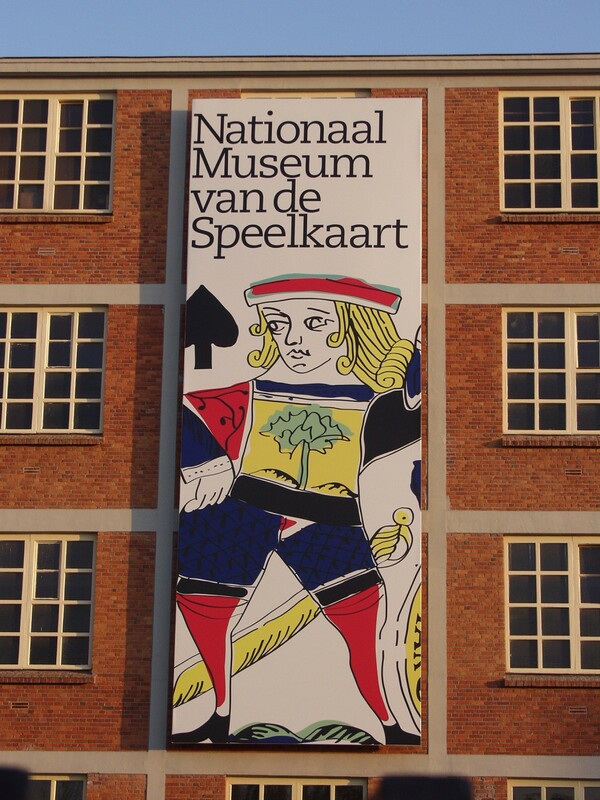 The Nationaal Museum van de Speelkaart is a 5-minute walk from the Grote Markt. The museum is also easy to reach by bike. From the Grote Markt enter Otterstraat. 150 metres further along, turn right into Beekstraat. Follow Beekstraat until you reach Druivenstraat. Thanks to its central location Turnhout has an extensive network of bus routes to surrounding municipalities and good connections with other towns in the central region. There is an express bus to and from Antwerp every ten minutes. Every hour there is a scheduled service bus to Leuven, Tilburg (NL) and the surrounding municipalities of the Campine region. For more detailed information please see the route planner on the De Lijn website. A train leaves to and from Brussels, Antwerp, Mechelen, Lier and Herentals every 30 minutes. Trains to Brussels and Antwerp are direct connections. Check the train timetable or at the station itself. The National Museum of Playing Cards is a 20-minute walk from the station. Leave the station via the station building. Cross Stationstraat and enter Merodelei. The city of Turnhout is happy to announce its partnership with several accommodations which offer special rates to all AEPM guests. To get the discount, please book directly through their website using the code ‘AEPM annual conference 2019’. Please note that not all accommodations have a website available in English.